The owner, who is an old friend of Jeff’s, contacted babienko architects to assist in completing the conversion of the Satellite Bar and Restaurant in the Capital Hill neighborhood of Seattle into the Unicorn Bar and Restaurant. babienko architects was then challenged with developing a design for the Narwhal in the 4000 square foot lower level space which had also been procured with the lease of the main floor bar. Previously an underutilized storage space, babienko architects repurposed this empty box into a 230 person bar, music venue and games room. 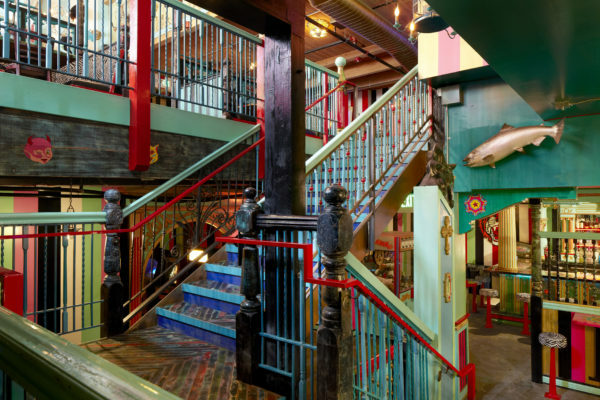 The staircase, which connects the main floor and lower floor, became Narwhal’s defining element by exposing a unique three-story interior space. Originally built as an auto dealership, the building features heavy timber construction. By revealing and enhancing the existing wood structure with minimal new structural intervention, babienko architects was able to capture this unconventional interior space.